Our first report of the CAhampionship season is courtesy of Darren who gives us a detailed report of the first day of our title defence, With some great pictures too. Reigning champions Middlesex (doesn’t that sound so good!) opened their defence of the County Championship at the Ageas Bowl with just one change from the team that defeated Yorkshire on that balmy evening at Lords in late September. The injured Compton replaced by the available again overseas player Adam Voges. Unsurprisingly Hampshire stuck with the same XI that played so well at Headingley last week to ensure the Yorkies got off to a losing start. Skipper James “Frank the Tank” Franklin (you had to be at the Champions Party to understand that one) won the toss and decided to bat. Robson & Gubbins opened as usual, with former Test bowlers Fidel Edwards (West Indies) opening the bowling from the Pavillion end and Kyle Abbott (South Africa) the Hotel end. Middlesex got off to a solid start, Robson with 10 off the first over (from Edwards) unusually outscoring Gubbins on the scoring rate. Edwards struggled to find his radar and was replaced by Gareth Berg after just 3 overs but Abbott was excellent throughout the first session with no reward. After 16 overs Edwards returned and looked a different bowler beating the bat twice in two balls before having Gubbins (13) superbly caught low down at second slip by Riley Rossouw. Middx 45-1. Steve Eskinazi joined Robson at the crease and must have been slightly relieved to see Edwards pull up injured just two overs later. Middlesex progressed to 84-1 at lunch, with Robson giving the only chance - a nick through the slips for 4 off the luckless Abbott, before reaching his 50 (82 balls, 9 x 4) with a boundary off the same bowler. The second session proved to be another very good one for Middlesex. After a slowish start Eskinazi was soon in fluent form as he and Robson set about building Middlesex’s lead. The 100 came up when a misfield by Berg (off Abbott) saw Robson run 3. By now Brad Wheal and Liam Dawson had been introduced to the attack but to little avail. Abbott continued to beat the bat, as did Berg who was also proving hard to get away but Robson & Eskinazi patiently reached their 100 partnership. At the half way point (46 overs) the light began to become noticeably poorer, though it didn’t stop Eskinazi hitting Dawson to the boundary to bring up his 50 (106 balls, 8 x 4) and with it, the Middlesex 150. Unfortunately Robson then departed, Berg finally getting his rewards having him caught at second slip by Jimmy Adams for 84. Middlesex now 150-2. 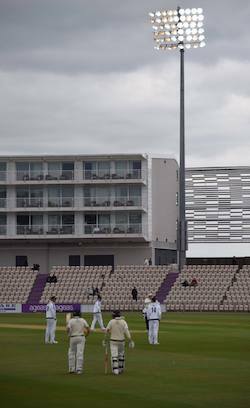 The floodlights then came on (52nd over) and remained on for the rest of the days play, as Dawid Malan made his way to the crease. Malan instantly looked at his fluent best scoring off his first ball before launching Berg and Dawson for sixes the latter taking Middlesex to 199, before a Dawson no-ball brought up the 200. Middlesex ended the session on 210-2 with Eskinazi also in commanding form on 72 not out. Middlesex’s dominance at the Ageas Bowl also continued off the pitch as DingyBags claimed the top prize in the “Golden Gamble” – well done that man! After tea Hampshire threw Sean Ervine into the attack as they sought to get a foothold in the game. The Zimbabwean soon had in hand in two wickets which proved pivotal in Hampshire fight their way back in to the match and dominating the final session. Firstly, Ervine caught Malan (43) at first slip off Wheal, leaving Middlesex 220-3. Then Ervine finally dismissed Eskinazi, bowling him for 82 after he had earlier survived a dropped catch by Vince at extra cover when on 58. Middlesex 234-4. Hampshire showed commendable spirit despite a succession of 12th men (Mason Crane, Ian Holland and Reece Topley) all fielding at times for Edwards (hamstring), Rossouw (chipped a bone in his finger) and Michael Carberry who left the field briefly for repairs to his finger. Adam Voges and John Simpson were now at the crease and the latter earned Middlesex our second batting point with a single off Dawson. Kyle Abbott then took the new ball and need just 5 deliveries to finally get the reward his bowling had deserved when he bowled Voges (24) who chopped the ball on to his stumps to leave Middlesex 258-5. With the light not great and the new ball in the hands of Abbott and Berg Hampshire really turned the screw as scoring became very difficult. Just 10 runs came off the next 10 overs before an uncharacteristic error of judgement from Simpson saw him chase a wide delivery from Wheal he could have left, to find one of the substitute fielders (Crane) at point. Middlesex 269-6. Toby Roland-Jones then joined skipper Franklin at the crease and safely negotiated the remaining overs, while hitting a couple of boundaries along the way to finish in double-figures. 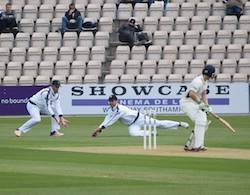 An entertaining day’s cricket saw Middlesex close on 290-6 with Hampshire coming back strongly in the last session to leave honour even.